If you're looking for solutions to iPhone stuck in recovery mode iOS 12, stop panic at this guide. The lately-released iOS 12 have laid up quite a number of users into the problem of iPhone stuck in recovery mode in iOS 12, be it with iPhone X/8/7 Plus or iPhone 6s and earlier. This page simply introduces the best way out for iPhone stuck in recovery mode iOS 12 (public release/Beta). Even if the recovery mode ended up in your losing data, you can get tips on restoring data to iOS 12 immediately. Backing up iPhone regularly is the best way to ensure data safety. You're more than advised to backup iPhone data before upgrading to iOS 12 in case of accidents like iPhone stuck in recovery mode/Apple logo in iOS 12. Now get the backup tool for free! The frequency of recovery mode showing up after jailbreak is 5 times higher than iPhone stuck in recovery mode after iOS 12 upgrade. This usually appears to users as iPhone stuck in Apple logo, and pressing any button don't wake up iPhone at all. You don't have to worry as this is not irrevocable if you follow the tips below. Madison – "My iPhone stuck in recovery mode & shows up only when it's plugged in, this happened to my iPhone only 3-month-old, not sure if battery replacing is going to help, can anyone help? This is the first solution to anyone from an Apple Technical Adviser – hard reset (or force restart) iPhone when iPhone stuck in recovery mode after iOS 12 upgrade. For previous strange iPhone not working errors, hard-resetting the device has managed to get iPhone backup to normal, so does iPhone stuck in recovery mode for iOS 12. You need to press and hold the home button and power button together for a few seconds until you see the Apple logo showing up like normal. For iPhone X/iPhone XS/XS Plus without a Home button, you need to press and hold the "Shut Down" button together with either the Volume Up or Volume Down button together. This is generally the last resort to fix iPhone stuck in recovery mode in iOS 12 because everything previously held on this device will be wiped out, no chance of restoring at all. It's hence recommended that you first take a look at the method recommended to fix iPhone stuck in recovery mode without iTunes or it wouldn't be able to help. However, if you already have a recent backup of iPhone data with one of the best iPhone backup software 2019, chances are that there's no need to seek help elsewhere. Here's how to fix iPhone stuck in recovery mode after iOS 12 upgrade. Step 1: First make sure iTunes on your computer is in the latest version – currently version 12.8 of iTunes, get the original Apple USB cable ready and plugged into computer or Mac. Step 2: Keeping pressing the Home-button of iPhone – and don't let go – while USB connecting it to iTunes. 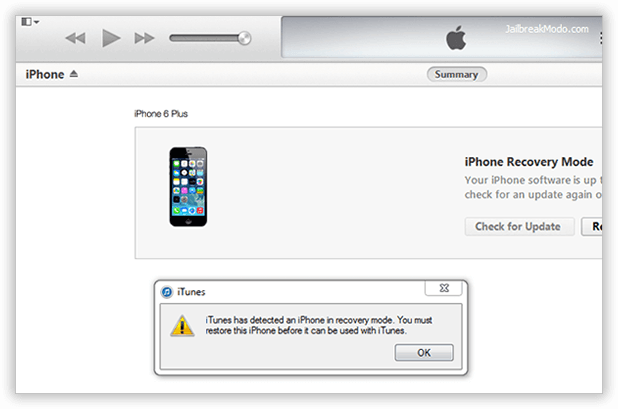 By then you'll see the dialogue box popping up saying "iTunes has detected an iPhone in recovery mode. You must restore this iPhone before it can be used with iTunes" and click on "OK". Step 3:On the main UI of iTunes, go to the Summary tab and find "Restore" option, click on to start restoring iPhone from recovery mode iOS 12, and then you may follow the instructions to complete. Tenorshare Reiboot is among the top 3rd-party software to return iPhone backup to normal in cases of emerygency such as iPhone stuck in recovery mode in iOS 12, after jailbreak, or somehow accidentally. The fix is quite easy to use if you USB connect the iPhone in need of repairing with computer or Mac sporting a Tenorshare Reiboot. 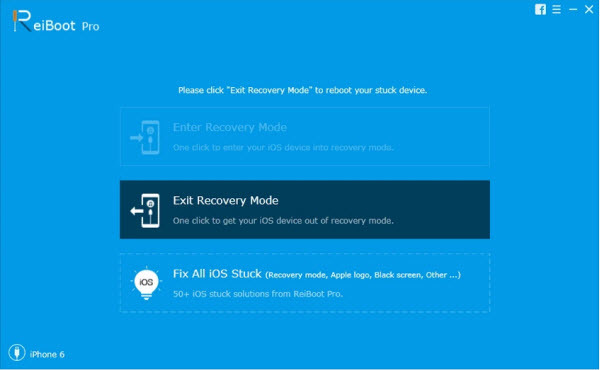 A simple click on "Exit Recovery Mode" that pops out automatically when the computer detects an iPhone in recovery mode in iOS 12 can lift you out of the trouble. Here's how to get iPhone data perfectly protected before iOS 12 upgrade. Step 1: Free download DearMob iPhone Manager for Windows or Mac, install launch it now. Step 2:You need to create a backup of iPhone (iPhone XS/XS Plus/X/8/8 Plus/7/7 Plus/6s/6s Plus or earlier, iOS 12/11/10 & earlier supported) in case of out-of-expectation iOS data loss. First USB-connect iPhone to computer/Mac. 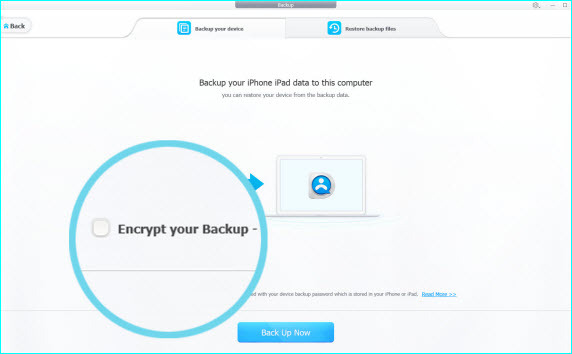 Step 3:Click on the "Backup" tab on DearMob iPhone Manager, you'll then be taken to the backup-ready interface to choose whether or not you'd like to encrypt iPhone backup. Step 4:Uncheck "Encrypt iPhone Backup" logo if you'd rather not password-protect iPhone backup, then hit on "Back Up Now"
If you've just recovered an iOS device running into iPhone stuck in recovery mode in iOS 12, lucky enough that all your data can be 1:1 restored to the new iPhone XS/XS Plus/X iOS 12.Here's how to restore iPhone without iTunes. Step 1: Also launch DearMob iPhone Manager, connect the iPhone recovered from stuck in recovery mode to it. 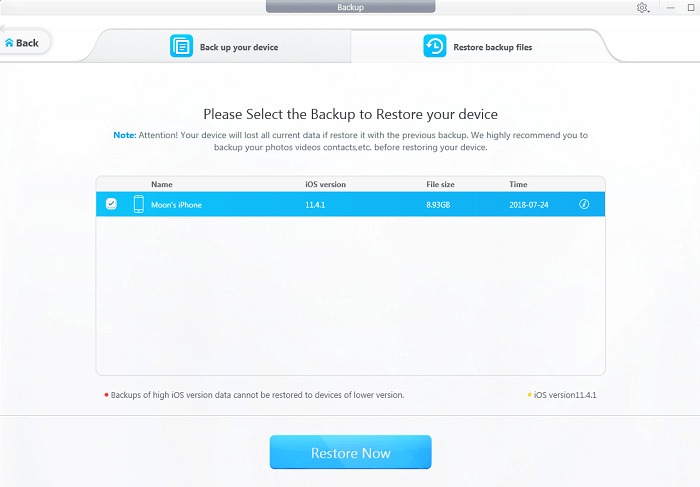 Step 2:Click on the "Backup" tab again, but switch to the restore backup files tab to locate to your backup files. Step 3:Choose the backup file you'd like to restore to iPhone iOS 12, then hit on "Restore" & input the password you used to encrypt iPhone backup if you did, and wait for the backup files to be transferred iPhone XS/XS Plus/X iOS 12 or earlier within only minutes. 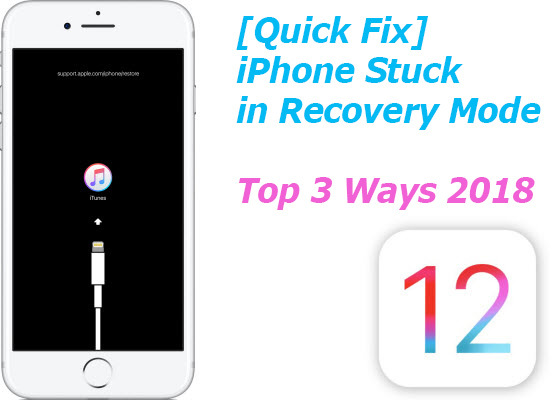 Although this article introduced to you several solutions to iPhone stuck in recovery mode in iOS 12, or after jailbreak, you really need to understand that rescuing iPhone with any of the tools recommended below involve risks to losing iPhone data. Get onto the good habit of backing up iPhone data regularly, or at least you should do it before iOS 12 upgrade to prevent iPhone from losing photos, contacts, music & other data. Don' t wait until it's too late to recover iPhone data. Now start to backup iPhone with DearMob iPhone Manager below!